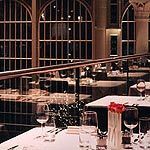 Balconies Restaurant is located above Paul Hamlyn Hall in the Royal Opera House and is for ticket holders only. It offers a fine dining menu of British cuisine and is ideal for a special occasion. Do you work at Balconies Restaurant? Must be a Royal Opera House evening ticket holder to dine. What did you think of Balconies Restaurant? 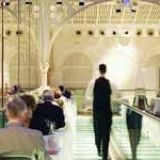 Located in the iconic Royal Opera House in the very heart of Covent Garden is the Balconies Restaurant. More modern than you may expect, it provides a pleasant accompaniment to one of the spectacular shows. The Royal Opera House is an integral part of the arts in London, adding a cultural heartbeat that continues to pull in the crowds – be it tourists or established Londoners. Within the exquisite white building lies various bars and restaurants to keep visitors fed and watered during the intervals of plays, dances, the ballet or opera. Located in Paul Hamlyn Hall lies Balconies Restaurant, high above on - unsurprisingly - a balcony overlooking all the action. From this standpoint you can enjoy a meal whilst taking in the hustle and bustle below during the intervals. The balcony itself is modern with clean lines, glass panels and a low-key air, quite contrary to the opulence of the stage and seating areas within the hub of the opera house. The recognisable arch of the Royal Opera House lifts above you with windows allowing in plenty of light – especially stunning pre-performance during the summer months. Tables are simply kept but are nice for a relaxed, upmarket meal and you’re not too cramped in – the restaurant consisting of a narrow walkway lining the balcony, rather than being cloying within a more centralised room. The atmosphere at Balconies Restaurant benefits from the excitement of the crowd below, chattering about the spectacular show they’ve just witnessed, eagerly anticipating the next act. The restaurant itself is a slightly more subdued affair, with people coming here to enjoy fine dining rather than a quick drink, but it nonetheless enjoys the upbeat nature of the interval and you feel a part of all the action whilst being comfortably above it. The staff are polite and pleasant, although a little more menu knowledge from the general staff would help with passing queries. However, the head staff know their stuff and are happy to talk you through the menu. A meal at Balconies Restaurant takes on a new twist as it entwines itself in the performance experience. Order your starter and main pre performance (usually around 6pm) and then leave your dessert until the first interval and the coffee for the second interval, giving you something to look forward to during the breaks. The speedy delivery of food is ensured by a five day pre-order time so they can whisk food in and out and you won’t miss a moment of the action inside the theatre. The quality of the food is decent, and the price remarkably low for such an establishment at just £39 for two courses or £47 for three. Starters consist of dishes like potted crab with ciabatta crisp, which is a light starter if a little lacking in flavour. However, the smoked salmon with caviar creme fresh is delicious, the salmon light and flavoursome, almost melting in the mouth. The creme fresh is creamy and rich and works well as an accompaniment. Mains offer up a nice balance of fish, meat and vegetarian options. A particular highlight is the seared fillet of sea trout with saffron mash and sauce vierge. Although overly yellow in appearance, the saffron mash is actually quite delicate and totally delicious. Creamy with an interesting underlying twist of flavour on the usual mash potato, it surpasses expectation. The trout itself is light and flakes away perfectly on the fork. If you want something a little heavier then the roast rack of lamb with Anna potatoes, pea and leek puree is one to try. The accompanying sauce is a little heavy, but the perfectly pink lamb is tender, juicy and rich. Desserts don’t disappoint with famous Covent Garden dairy Neil’s Yard providing the cheese for the cheese board, which is plentiful and well chosen. Be sure to try the award winning chutney – cutely named ‘Slap and Pickle’ – which is so good you’ll want to eat it on its own. If you have a sweet tooth then the nougat and coffee parfait with balsamic syrup is almost sickly sweet but perfect for satisfying a craving. You can pre-order wine or wait until the evening. It’s recommended you ask your waiter for a wine recommendation – be it red or white – and indulge in a glass or two. Wine isn’t as expensive as you may imagine (although there are options to suit most budgets), and it’s great for relaxing between acts and unwinding. All in all, Balconies Restaurant provides an excellent accompaniment for the ballet or opera at a reasonable price. If you’ve splashed the cash on a ticket and still want to enjoy a decent meal to heighten the evening then this is a worthwhile choice.